I’ve got one of her books and a DVD, but there’s nothing like meeting Judith MacKenzie face to face. I had the wonderful good fortune to be invited to the home of a new friend last weekend, who just happens to be friends with Judith. 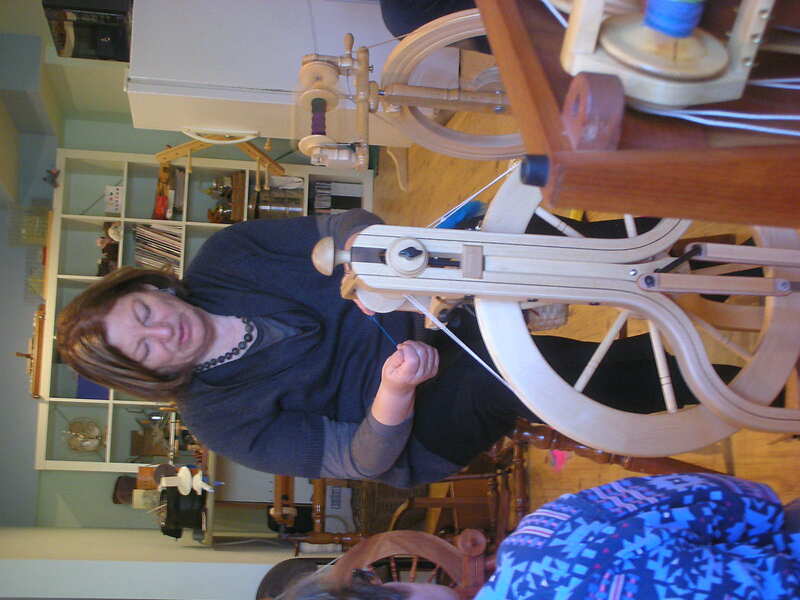 While she was visiting this woman, they decided to host a workshop on Wheel Mechanics and Spinning the Diameter of Yarn You Want. It was that great combination of learning and good fun. I have found over the years, that the best instructors are those who combine technical knowledge with good storytelling abilities. Jacey Boggs has that quality and Judith has it in spades. This woman has had a full and interesting life! And she shares her tales with gusto. 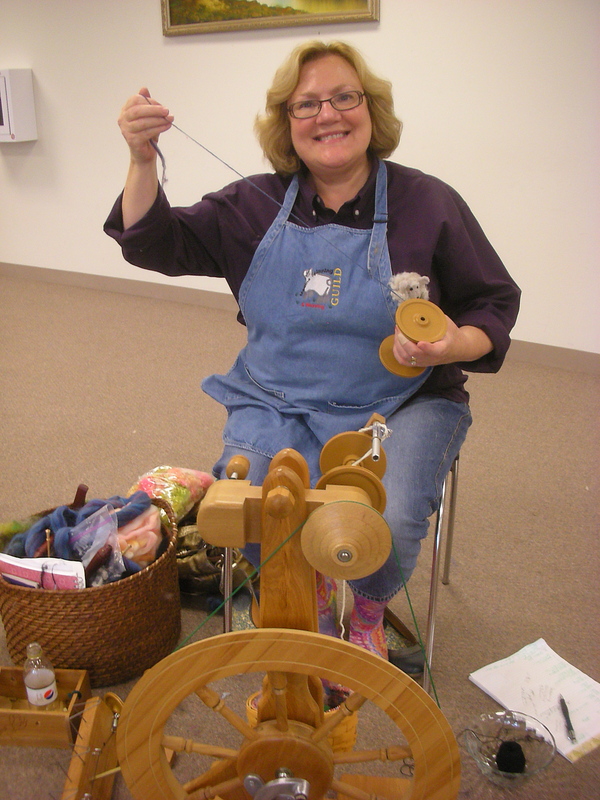 So you walk away from her workshops needing time to process all her wonderful tips about the science and art of spinning while also smiling about her stories, adventures and passion for history and experience. It was an amazing day and I will treasure it. I think it’s a universal feeling that we all need to “run away from home” once in a while. Between a job, kids in school, homekeeping, and organizing guild workshops- a day in the country is in order to get me centered. And on this amazing fall day last weekend, we took the bikes down to Gambier, Oh where it connects with the Kokosing Gap Rail-Trail. 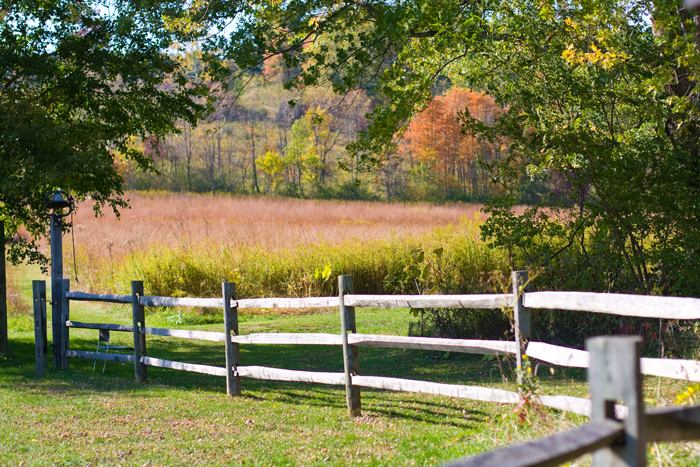 The trailhead is located near Kenyon College, lovely in its own right. 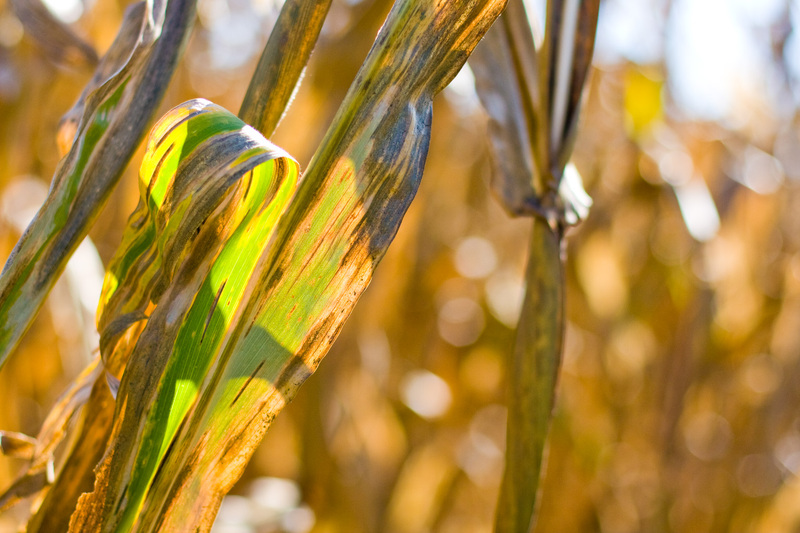 But our eyes were focused on the rural fall landscape where trees meet cornfields and the sound of cows and their abundant smell are in the air. We make an annual trip to this trail because of it’s quiet beauty. We are lost in our thoughts as we progress on the 13 mile trek. My mind goes toward the colors and how they might inform my weaving. We always visit the Kenyon Environmental Center adjacent to the trail. 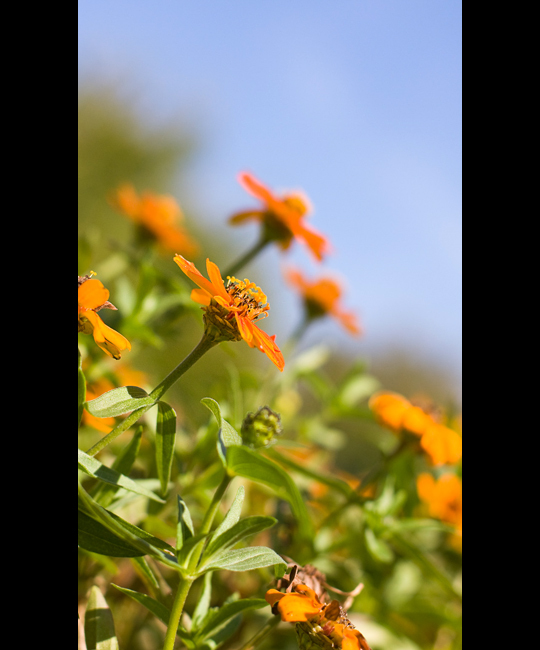 There are gardens, hummingbird feeders, and a central Ohio fall landscape. I hope you find the time to get away before the Fall colors disappear. This beautiful season goes much too quickly. Don’t let it pass you by. 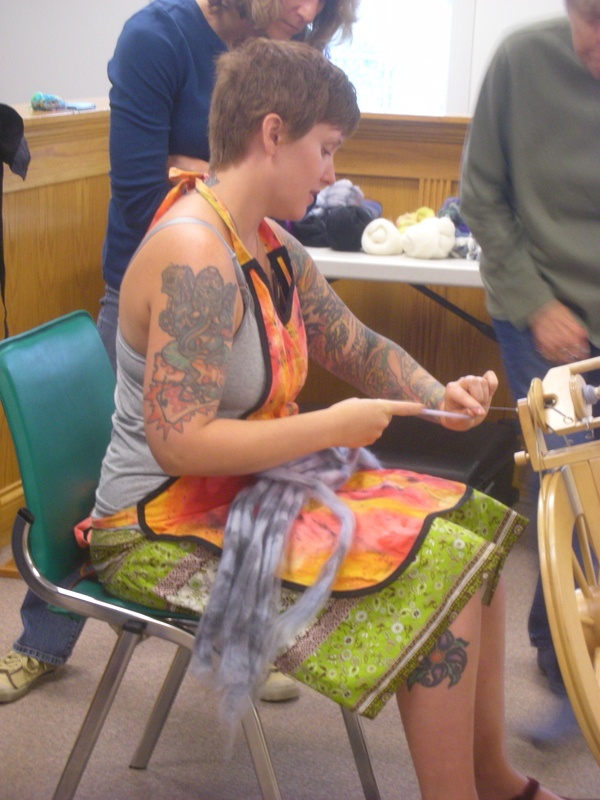 Jacey Boggs taught a 2-day workshop for my guild last weekend. Now I know why she’s the rock star of fiber! Both in style and technical know-how, this chick rocks it out of the park. To make people feel comfortable, she wore a sweater at the beginning of class. Then she explained to the mostly middle-aged crowd that she had tattoos and “did we mind” if she took off her sweater. Yep, her arms are pretty covered, but the magic of her spinning instruction quickly overshadowed her body art. 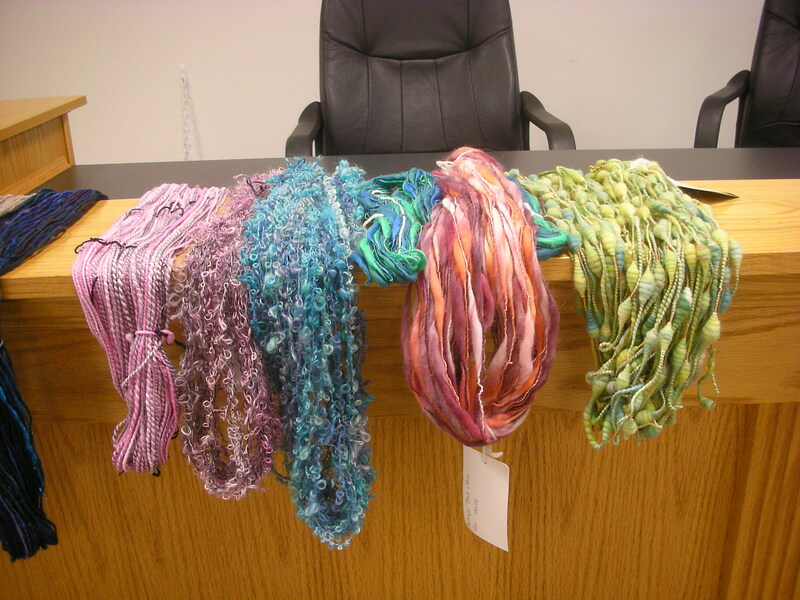 Jacey offers instruction on a multiple of cool art yarns. These aren’t just thrown together willy-nilly. She has figured out the technical approach to making art yarns that can be controlled and duplicated with any fiber you choose. She also talked about what you can do with the yarns and feels they are particularly appropriate for accents to knitting and weaving projects. 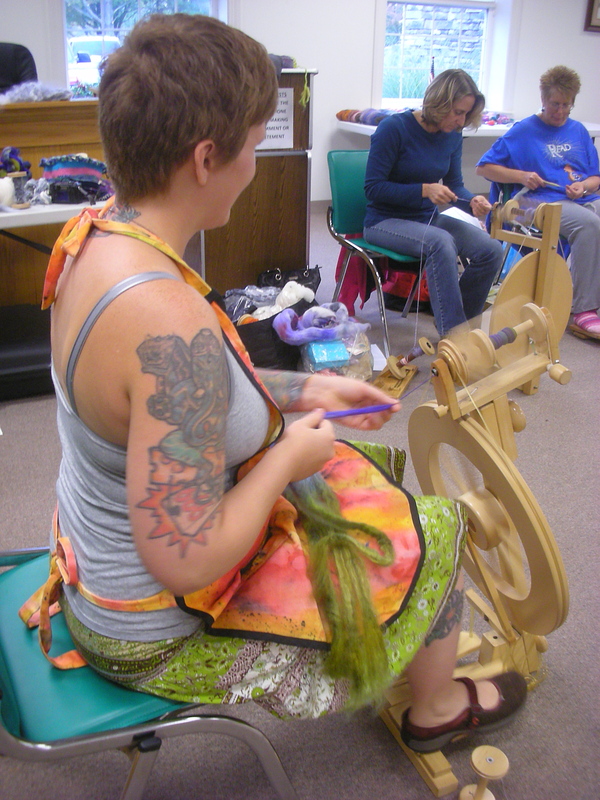 Coils, fauxcle, corespinning, wrapping, attaching foreign objects, you name it, we tried it. The group was so enthusiastic which made it particularly fun. We were enchanted with Jacey’s winning personality and her straightforward approach to teaching us all her secrets. She was a gem of an instructor. We learned so much. I would recommend a workshop by Jacey any day. But book her now. She is so popular, she is scheduling up to 2 years in advance. By the way, I interviewed her for an episode of WeaveCast. I am still editing the audio but when it’s ready to post, Syne Mitchell will be sure to put the word out.